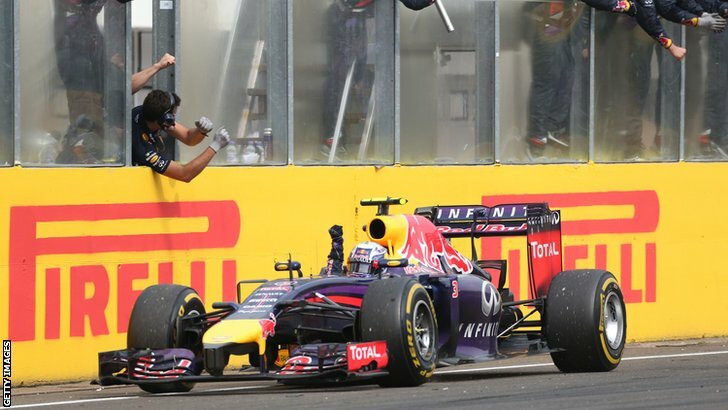 Home » Formula One: Ricciardo storms to second win in sensational Hungarian Grand Prix! 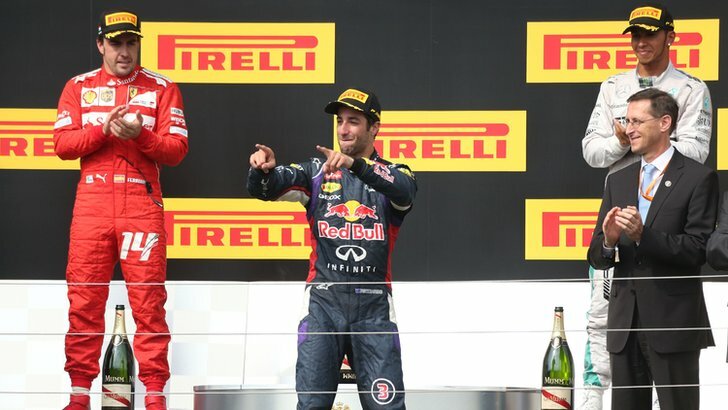 Daniel Ricciardo has taken his second ever Formula One victory in today’s 2014 Hungarian Grand Prix after an epic race saw the Australian overtake Lewis Hamilton and Fernando Alonso in the final 3 laps to take the lead. Alonso and Hamilton had pitted much earlier in the race and were struggling for grip in the closing stages. Alonso managed to hold onto 2nd place, Ferrari’s best finish this year, with Hamilton managing to defend hard against team-mate Rosberg to take the final step on the podium after starting from the pit-lane. The Hungaroring suffered a massive down-pore with just under an hour until lights out. The drivers started the race on the intermediate tyre, with Nico Rosberg just maintaining the lead on the run down to turn 1. Sebastian Vettel couldn’t get passed Nico from second and had to tuck into his fellow countryman’s slipstream. Valtteri Bottas had a great start from third and managed to get around the outside of Vettel at turn 1. Vettel was then compromised on the exit and subsequently lost 3rd to Fernando Alonso. Kevin Magnussen and Lewis Hamilton got under-way shortly after, with the pair starting from the pits after qualifying mishaps. Lewis was on the attack immediately as he passed Kevin before the pair had got to turn 1. Lewis was in trouble at the next corner however, as the lack of a formation lap meant that Lewis had no temperature in his brakes. The car spun round, with the front left wheel just rubbing the barrier. He managed to get away with no problems to set after the pack. He quickly passed Kvyat (who stalled on the grid and started last in the pits), followed by Ericsson, Magnussen, Maldonado, Chilton, Kobayashi, Bianchi, Grosjean and then finally the Q1 qualifier Kimi Raikkonen in a storming attack. Hamilton had got up to 13th place by lap 8. Hamilton’s charge was halted on lap 9 after a heavy crash for Marcus Ericsson bought out the safety car. The Caterham driver got loose in the treacherous conditions at turn 3 damaged almost every corner of the car. Nearly everyone jumped into the pit-lane bar leaders Rosberg, Bottas, Vettel and Alonso. They all had to wait a lap to pit, but had lost out massively and came out in the mid-field, with Daniel Ricciardo taking the lead during the stops. All the drivers put on the dry tyres, with the exception of the two McLaren drivers. McLaren chose to put Button onto another set of Intermediates, with Magnussen not pitting. The race was set to get back under-way on lap 11, but the safety car had to stay out a few extra laps after Romain Grosjean spun his Lotus into the barriers under caution. Ricciardo led the way when the safety car came in, but Jenson Button used his Inters to his advantage to pass the Red Bull on the inside into turn 1. Team-mate Magnussen managed to gain a place on Nico Rosberg for 4th place. Rosberg then lost another place to Jean-Eric Vergne into turn 2. He was now 6th ahead of Sebastian Vettel, with Lewis Hamilton now within a second of his team-mate after a great restart. Jenson Button soon pitted from the lead, with Magnussen following shortly after. The McLaren team thought that more rain was on the rain, but it never materialized. Button fell down to 16th place as a result after pitting for dry tyres. As a result, Ricciardo re-took the lead, with Massa and Alonso 2nd and 3rd. Vergne was still holding onto 4th ahead of Rosberg, with Vettel still being hounded by Hamilton in 7th. Sergio Perez soon interrupted the tense battle for 4th as he got wide on the exit of the final turn. The outside of the circuit was still holding moisture after the wet start to the race, which pitched the Force India into the inside wall. The Mexican stepped out of the unhurt, but the safety car had to be implemented once more. Daniel Ricciardo and Felipe Massa took to the pits from 1st and 2nd for new tyres, with Alonso, Vergne, Rosberg, Vettel and Hamilton vaulting ahead of them as they stayed out. 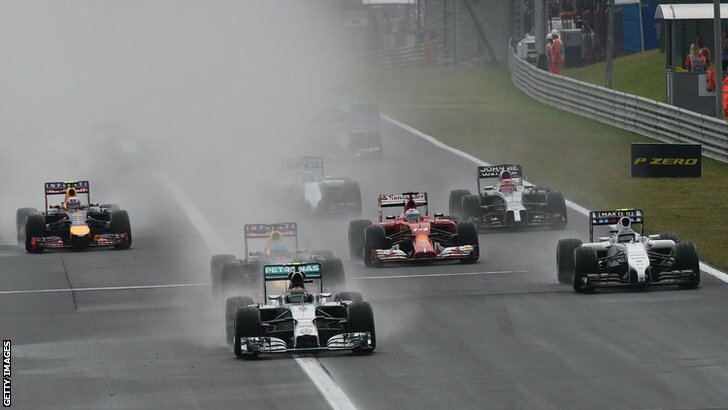 Alonso led the field away once more, with Rosberg and Hamilton desperate to pass Vergne and Vettel. Neither Mercedes could pass the cars directly ahead of them. After several laps, Nico bailed into the pit-lane to try and find some clean air. As Rosberg took to the pits, Sebastian Vettel almost coped Perez’s incident as he got too wide on the exit and spun in a complete circle, barely grazing the inside wall. 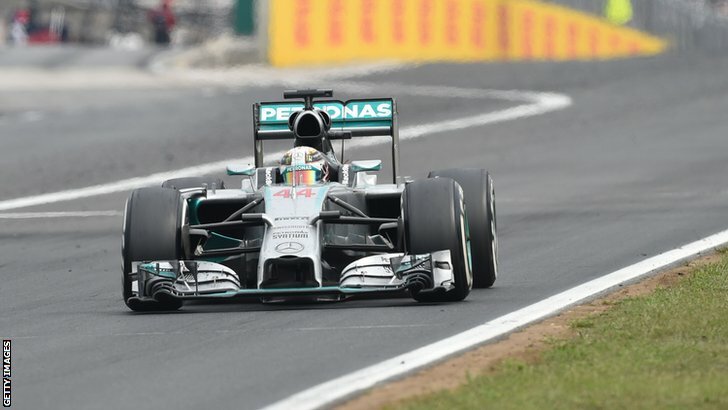 He lost a number of positions, which allowed Hamilton crucially to pass the man who had been holding up for so long. Lewis capitalized on the momentum to get onto the back of Vergne, who had been holding up team-mate Rosberg. Hamilton was unable to get him into turn 2, but he managed to slipstream the Toro Rosso up to the fast turn 4 to pull off an unbelievable move around the outside for 2nd place. Lewis soon started to eat into Fernando Alonso’s lead. He became the fastest car on track, with Rosberg soon being informed that Hamilton would emerge ahead of him when he pitted. Despite pulling off a great move on Valtteri Bottas for 9th, Rosberg was unable to do anything about Hamilton. The 2008 champion pitted from 2nd for what would be his final stop on lap 40, 1 lap after former team-mate Alonso, who kept the lead in his Ferrari. Both emerged ahead of Rosberg. Ricciardo, who had pitted earlier on, was now back in the lead of the race ahead of Massa. Raikkonen had moved up to 3rd after not pitting for a second time, with Alonso 4th ahead of Hamilton and Rosberg. Raikkonen soon pitted and emerged alongside Sebastian Vettel. The two went wheel to wheel, with Raikkonen edging the Red Bull toward to grass at turn 3 to keep 8th place. A frustrated Rosberg radioed the team asking why he had not been let by yet, but soon his tyres started to give out. He began to lose time to Hamilton. Ricciardo’s tyres also started to give out at the front, with the Australian pitting on lap 55. Rosberg pitted a lap later and emerged in 7th behind Kimi Raikkonen’s Ferrari. The final 12 laps saw the excitement reach fever pitch, with Hamilton catching Alonso for the lead, whilst Ricciardo caught him in the Red Bull. By lap 60, Hamilton was just 1.6 down on Alonso, but Ricciardo had decimated the gap to the Briton to under a second. The pressure kept mounting, with Alonso missing the turn 6 chicane on lap 63. He put his hand up to acknowledge that he was slowing down so that he wouldn’t be deemed to have gained an advantage. Nico Rosberg had blasted past Kimi Raikkonen and Felipe Massa with ease. He was now using his far fresher tyres to take chunks out of the leading trio as they held each other up. He was taking 2-3 seconds a lap out of Ricciardo in third. Ricciardo was soon made aware of the incoming threat. He tried a daring move around the outside of Hamilton at turn 2, but ran wide instead. 2 laps later, he tried it again and managed to hang on to take 2nd place away. He wasted no time in getting onto the gearbox of Alonso. The pair had dueled right up to the finish last week in Hockenheim and it was now down to a re-match to decide the winner this time round. The Australian had pulled of some daring lunges up the inside of the Spaniard last week. It seemed as though that was just a dress rehearsal for this time. Ricciardo used the DRS to get near to the Ferrari, but he was still not alongside. He braked as late as he could and managed to get right up the inside of the Spaniard. Alonso’s worn tyres meant that he could do nothing to fight back against Daniel, meaning that with just 3 laps to go, the lead was his. With Ricciardo scampering off into the distance, the fight was on for second place. Hamilton was all over the back of Fernando, but Rosberg had now joined the fight. Hamilton was slow off of turn 1 as they started their final lap, which allowed Nico a chance to pass. Lewis covered the inside line and pushed his team-mate almost onto the grass in a forceful defense. A little further up the road, Ricciardo was cruising to the line. He had more than enough fuel and tyre life to see him through the final lap. He rounded the final corner, punching the air as he did so and then crossed the line to take his 2nd win of his Formula One career. Fernando Alonso managed to hold on to take a sublime 2nd place thanks to the last lap fight between Hamilton and Rosberg. The nature of the track meant that there was no other opportunity for the championship leader to pass Lewis, meaning that Hamilton would defy all odds and secure a podium finish after starting from the pits; equaling the feat achieved by Sebastian Vettel at Abu Dhabi in 2012. Rosberg had to settle for 4th place ahead of Felipe Massa’s Williams. Kimi Raikkonen got 6th after a disappointing qualifying session yesterday. Sebastian Vettel recovered from his 360 spin to take 7th, with Valtteri Bottas’ run of 3 podium finishes coming to an end after a disappointing 8th place. Jean-Eric Vergne‘s 50th Grand Prix saw him get 9th place after fighting near the front during the race. He finished just ahead of Jenson Button, who recovered from McLaren’s strange strategy to get 1 point. Adrian Sutil narrowly missed out on claiming Sauber’s first point of the season in 11th, but he still finished ahead of the McLaren of Magnussen. Pastor Maldonado took 13th place after under-steering into Bianchi’s Marussia early on. Daniil Kvyat took 14th from the pit-lane after stalling on the grid, with the two Marussia cars being the final two cars to finish the race. Esteban Gutierrez is the first retirement in the finishing order after suffering an MGU-K failure on his Sauber. Kamui Kobayashi also befell mechanical issues during the second safety car period. 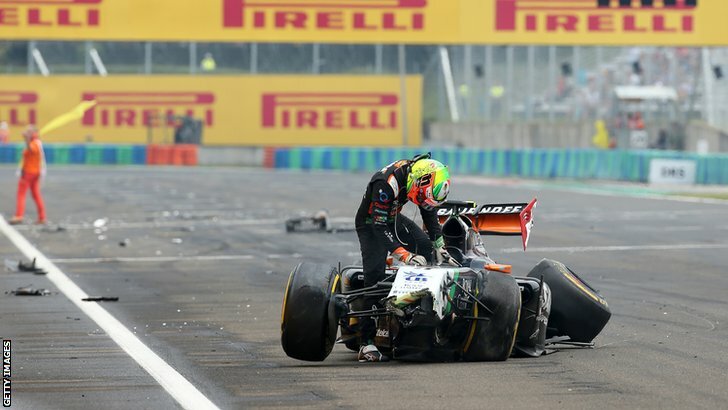 Nico Hulkenberg’s incredible statistic of finishing every race this year in the points came to an end after hitting his team-mate during the race. He came to a stop a few laps before Perez hit the pit wall. They joined Marcus Ericsson who was the first man to retire after his crash on lap 9. Not classified: Marcus Ericsson, Romain Grosjean, Nico Hulkenberg, Sergio Perez, Kamui Kobayashi, Esteban Gutierrez.